Hello everyone – Asia King here. I’m back today with an inspirational card in celebration of the Breast Cancer Awareness Month. Breast Cancer Awareness campaigns are usually associated with a pink colour. As I wanted my card to include an element of hope, I added splashes of green colour as well. I really enjoyed making this card, especially my glitter tiled background. I started by pulling out a large scrap of white card and a cute decorative white panel that was pre-embossed and had a round aperture. 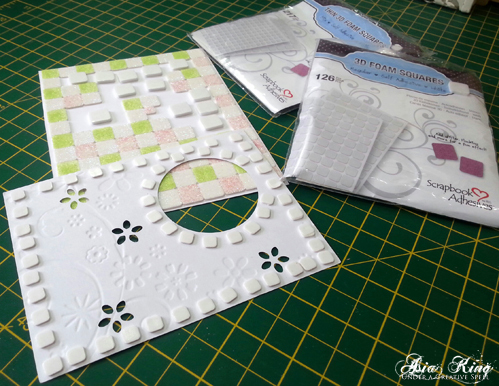 I began sticking rows of Thin 3D Foam Squares – Mix White to create an area slightly bigger than the panel. I used the panel as a guide to see which areas would be showing through the apertures as they needed to be fully covered with the foam squares. Next I covered the squares in glitter, alternating the colours to create a pattern. When I finished, I trimmed the excess card around the squares background leaving a small border. To mount the decorative panel onto the background I used Thin 3D Foam Squares – Mix White and 3D Foam Squares – White, Regular. Before you do that, you might like to swipe the front of the panel with some chalk/matt paint and add the Photo Corners – Classic Style, Pink (available during October at your local retailer). To adhere the background to a green card blank I used E-Z Runner® Permanent Strips – Refillable. Next I rummaged through my stash again and pulled out various (long forgotten) elements, a selection of flowers and florist’s fibers. 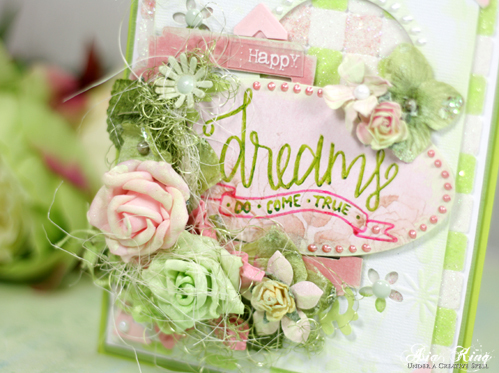 To create the sentiment panel I inked the Dreams stamp with PITT pens and stamped onto an oval die cut element. The die cut was slightly glossy, so to avoid smudging the ink I heat embossed it with a clear embossing powder. To adhere all my florals and fibers I used DODZ™ – Small; DODZ™ – Medium; DODZ™ – 3D. To finish the card I added some half pearls and Liquid Pearls. Photo Corners – Classic Style, Pink; Thin 3D Foam Squares – Mix White; 3D Foam Squares – White, Regular; E-Z Runner® Permanent Strips – Refillable; DODZ™ – Small; DODZ™ – Medium; DODZ™ – 3D. Cardstock: Bazzill Basics and Core’dinations David Tutera (Die Cut Circle). I hope you enjoyed today’s inspiration. Happy dreaming everyone! This entry was posted in 3D Foam Squares, Adhesive Dots & Lines, Adhesives, Cards, Crafts & Tutorials, Creative Photo Corners, E-Z Runner® Dispensers, Spring, Wear your Adhesive on the Outside and tagged 3D Foam Squares Regular White, Adhesive Dots 3D, Adhesive Dots Medium, Adhesive Dots Small, Asia King, Bazzill Basics Paper, Card, Core'dinations Cardstock, E-Z Runner Permanent Strips Refillable, Faber-Castell Design Memory Craft, Neat and Tangled, Pink Photo Corners, Stampendous, Thin 3D Foam Squares White, Wear Your Adhesive on the Outside. Bookmark the permalink. 3 Responses to "Happy Dreams Do Come True"
Beautiful!!! Love the idea to use 3-D foam squares with glitter! This card is amazing! Love the thin glitter squares BG idea but the whole card is lovely all the layering and details I do like the green with he pink. Just a wonderful card with a wonderful message beautiful. This is absolutely beautiful. Love all the detail.